It’s that time of the year again, when adult Lego fans with children old enough not to destroy everything they touch find out what they’ll be adding to their Lego holiday display this season. Last year we got an amazing train. This year we get a place for it to stop. The Winter Village Station is a companion piece to last year’s Winter Holiday Train, a gorgeous Christmas-themed engine that had all the trimmings, save one. When it comes around the tracks this winter, there’ll be a lovely little station waiting for it. Built to connect to the Winter Holiday Train, Winter Village Station features everything the little Lego people going to and from the ever-expanding Winter Village could want. There’s the main building, which keeps the tiny plastic people from getting tiny plastic frostbite. I love that the piece for Christmas wreathes is just a green version of the piece used for toilet seats. The station might look small, but it’s got all the amenities. There’s the ticket booth . . .
. . . the coffee stand . . .
. . . plenty of seating for grandma and her grandson, heading off on a polar adventure . . .
. . . and even a front stoop where the coffee lady can meet with a minifigure I am going to assume is a member of a shadowy secret society, based on the symbol on his suit jacket. I guess he’s the ticket agent. Mmmhmm. My favorite piece in the set is the bus. What a charming little old-timey bus, ferrying passengers back and forth between the bustling city center and the remote station. And since the set connects with the railroad, there’s plenty of opportunities for tragedy to strike. 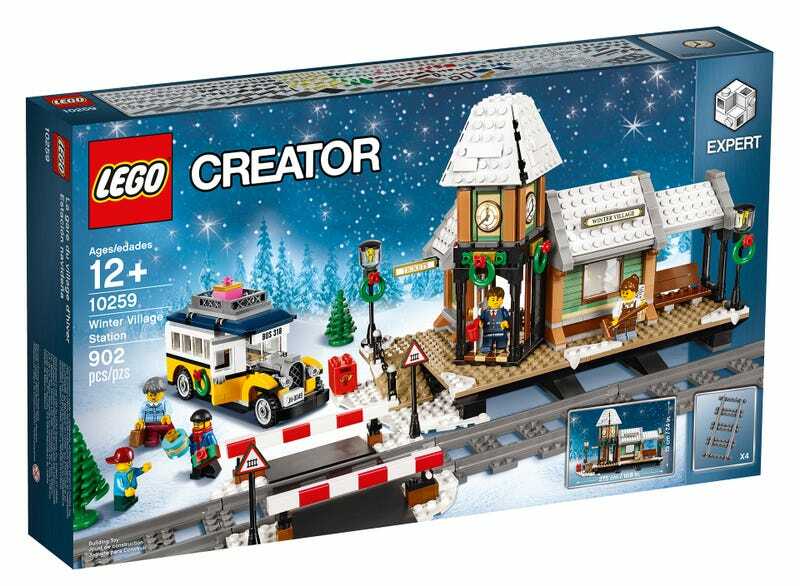 The Winter Village Station set goes on sale October 1 for $79.99. It’s a very good reason to buy last year’s train, if you haven’t already. Clever, Lego.